‘I have to write what I am doing now.’ That’s what came in my mind as I first read about this contest. My sedentary, lazy and careless lifestyle increased lots of weight in me and gave in gift the ailment of hypertension. Even after living with hypertension I didn’t change my routine and bad health habits like inactivity in my daily routine, eating unhealthy fried food and things like that but one morning when I started feeling tired during a small activity of bathing I realized I am not doing right with myself. It was then I observed my fat tummy which has become prominent thing in my body. I remembered how even my five year old niece tease me of fat tummy along other family members and they are not doing it for fun but to make me realize the bad I was doing to myself. My office is just more than a kilometer away from my home but I used to drive their by two wheeler. My first step was to walk the distance. Stop long sittings in front of PC. Instead started talking a walk after every hour. Stopped eating fried and junk food. Walking more stairs than before. Instead of calling someone in office or home for water, tea, coffee, etc started going to the kitchen to get them. Drinking more water than before. I am following this routine from last one week and I am seeing improvement in myself. I have lost two kilos which is a good booster for me. 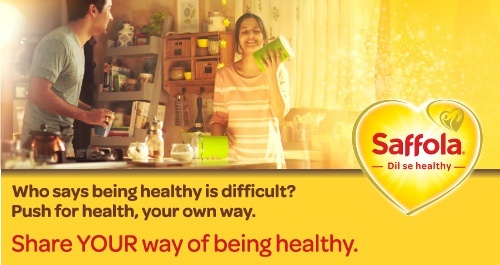 Here I should also mention that Saffola advertisement gave this idea to me of #ApneTareekeSeHealthy. I have started including mild stretching exercises and some yoga postures in my routine. I know gym can give me better results but knowing how inactive my body has become one or two day of gym could have killed my enthusiasm of losing weight. I am satisfied that instead of crying over spill milk I have taken precautions to not let milk spill. It's such a great initiative and your effort can help to motivate me. I've been diagnosed into high risk cholesterol and looking at diets to break my fat tummy....exercise, jogging, walking to get back into shape.